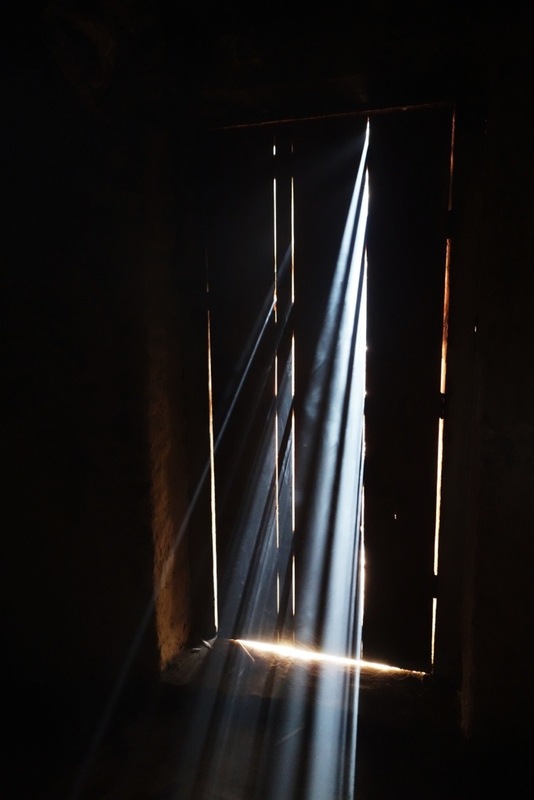 Their house is filled with smoke, and without electricity, the natural light seeping in from the open door gives the mud hut a homey feel. 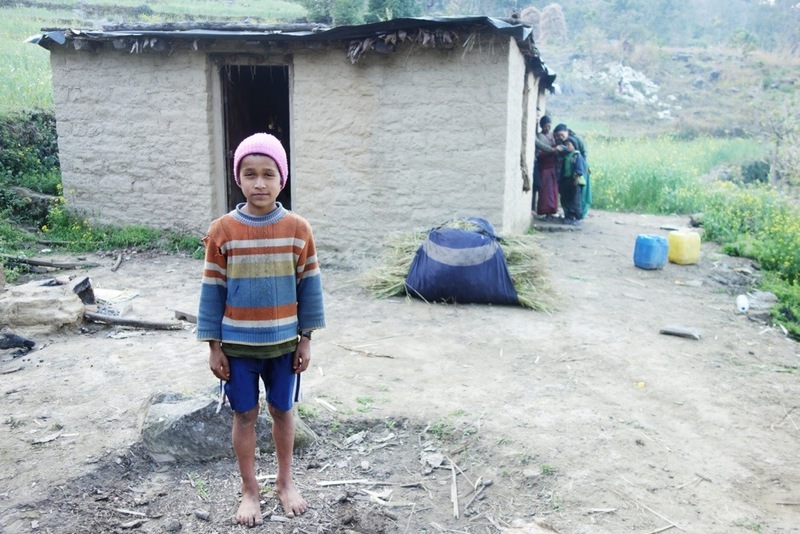 A couple and their two children I met in a field in Far Western Nepal have brought me back to their small humble abode, a one room mud house with a few blankets on the floor in one corner, and a pile of wood for the fire in the other. The ceiling is covered with hanging corn, drying to be made into flour, and besides that, there is hardly anything else in the house. They have three or four cows outside and fields surrounding them where they grow crops, they are self sufficient farmers living off of the land. 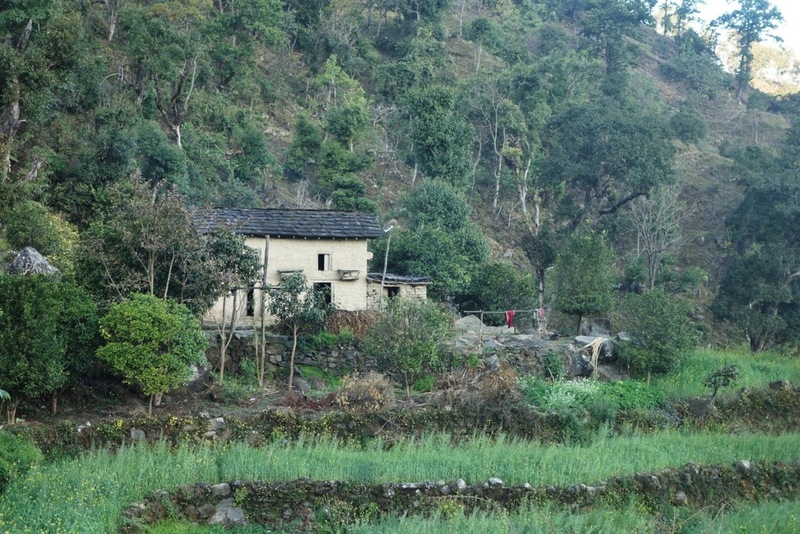 Their small village is composed of a dozen or so houses spread out near the top of one of the rolling foothills in the Himalayas. Here is their home (and the boy I stayed with). And their bathroom, a doorless one at that! The natural light in their home was wonderful. 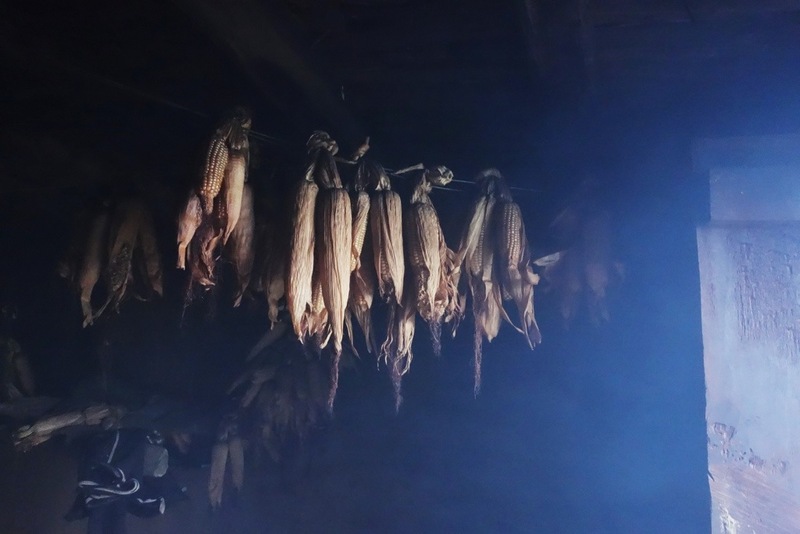 A bit of corn hanging in the smoke filled room. The couple worked together to make dinner, a simple meal of roti dipped in spices. They have very little food, and their diet consists of roti, dal, and rice, and little else besides the sugar I saw them making yesterday. Their diet changes slightly with the seasons depending on what is ready to be picked at that time. By the time we finished eating it was completely dark in their hut and the surrounding hills as no one has electricity. The sky was filled with stars, living away from most civilization definitely enhances the beauty of the night. I crawled under the blankets with the two children, who had decided they quite liked me, calling me “didi” or sister, while the mother and father shared another blanket on the floor beside us. 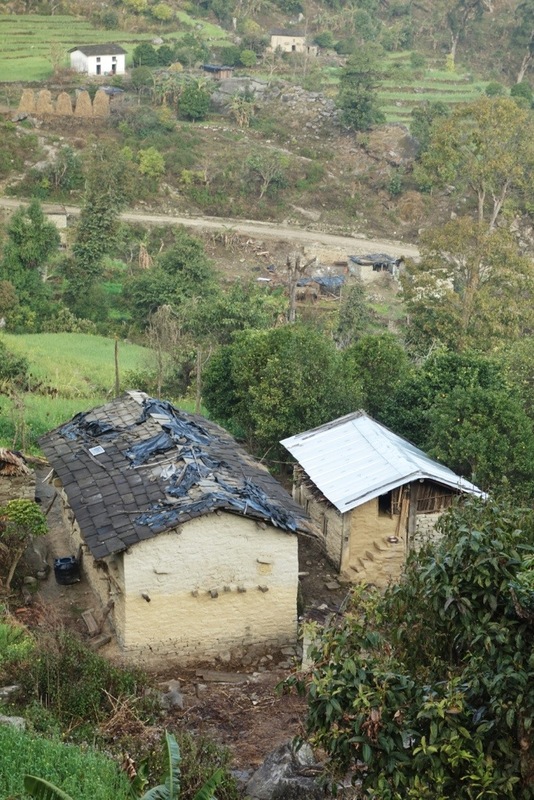 I fell into a peaceful sleep, in a small mud hut in the hills, surrounded by nature and good-hearted people. Here is the girl, quite a feisty little eight year old! 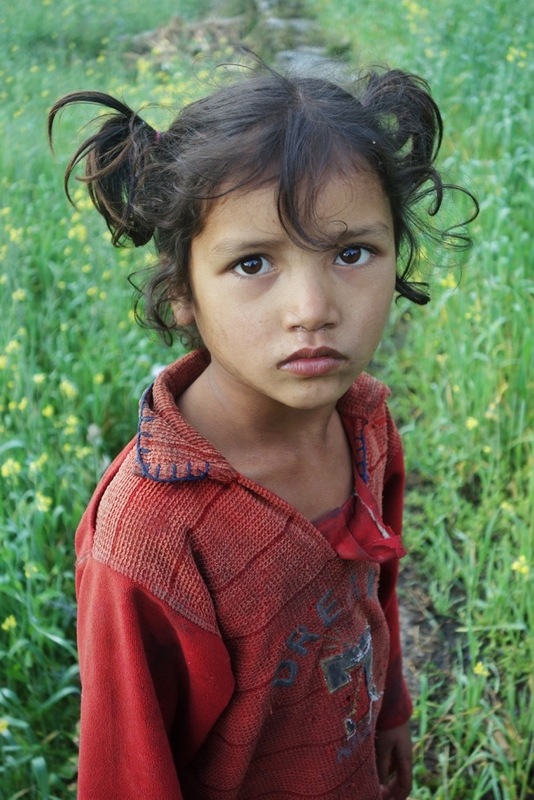 She is a tough girl, usually laughing and being silly, though like many of the children she always has on a serious face for the camera. 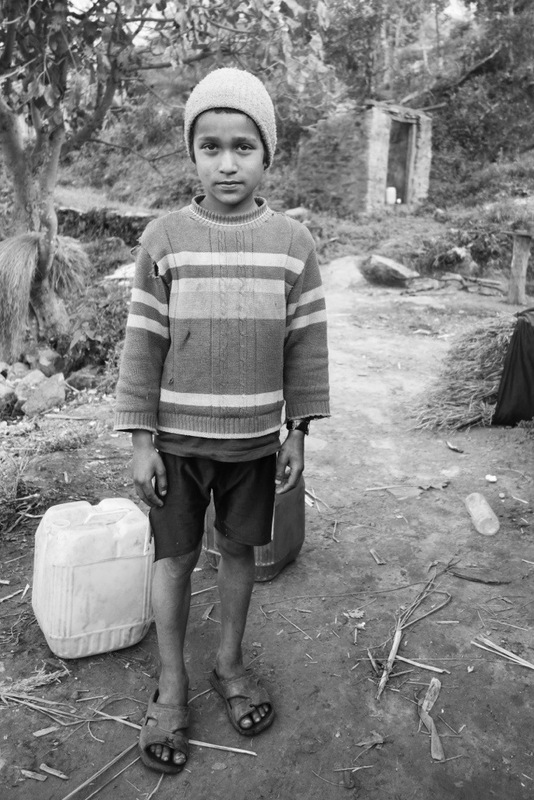 Here is the boy after having returned with jugs of water that they have to fetch daily. It is about a fifteen minute walk each way. This is the mother and her friend. They were shy at first having never had their picture taken, but after a while asked me for one after seeing the children enjoy it. Here are some of the neighbors houses. Though theirs was just one room, many of the surrounding ones were two stories, where the cows live in the bottom and the humans on top. 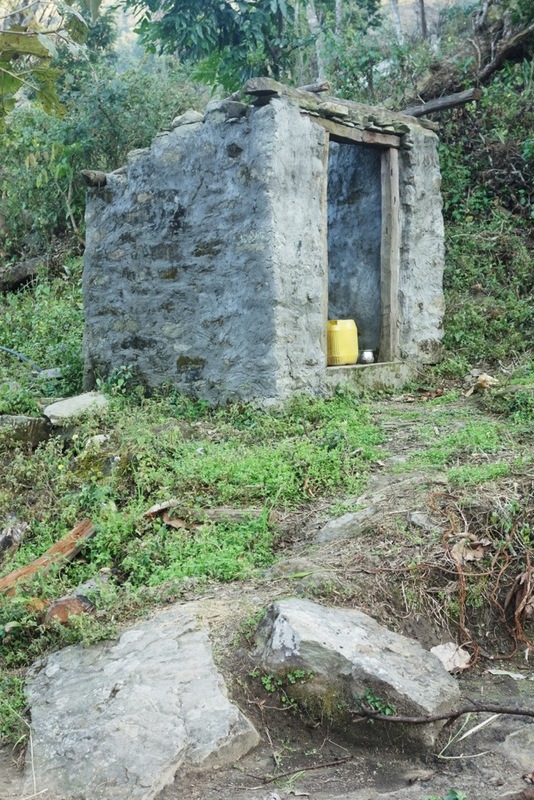 This entry was posted in Nepal and tagged far western nepal, Mud huts, Nepal culture, not touristy Nepal, off the beaten track Nepal, rural Nepal, the real Nepal, village Nepal by The Wandering Nomads. Bookmark the permalink. Wow! Shirine, what meaningful experiences you are having. I wonder at the impact of your presence on the families you visit with. You may become part of the folklore of some of these spots. What a responsibility! And I agree with you about the light in the home. Fabulous! Great shots! Gosh! I think about how much of our time and energy go into procuring and tending our creature comforts and wonder what it would be like if they were gone. Hmmmm! Thanks for sharing the world!! Hugs! When I think about the impact you will have on thousands of lives, I am just so happy that it is you that is representing the first “Western” face they encounter. I hope that you can empower women and children and also change some stereotypes that others may have of us as well. I am just in awe of you every day and talked about you to several people on my trip. You are simply amazing!